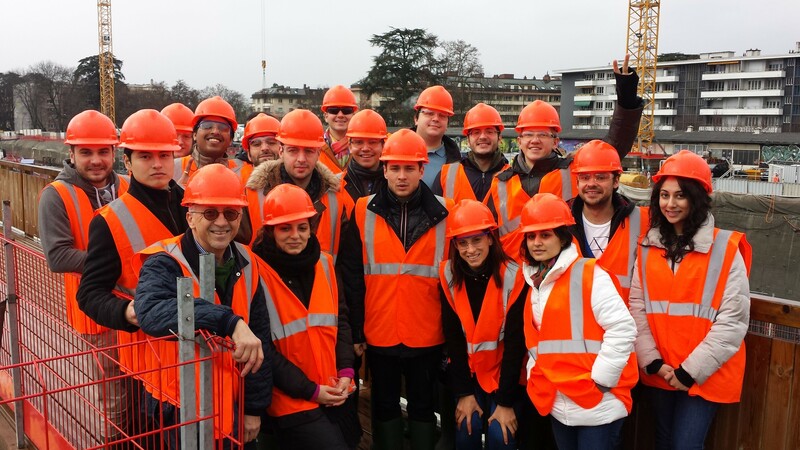 On February 13, the Master in International Business and Finance classes in Project Management were welcomed by the CEVA Project team in Geneva. The objective of the visit was for the students to see what “applied project management” means and what theory studied in class is good for. Indeed, the CEVA railway/metro track that will link Geneva’s Cornavin station with the Eaux-Vive station and finally the French border town Annemasse (hence the project’s name) is the second biggest construction site in Switzerland. The class first was briefed on the history and organization of this 1.6 billion CHF project initiated in 2012 and whose completion is planned for December 2017. Then the students had the opportunity to question the head of the project team, a civil engineer, about his working methods and tools. One student summarized the utility of the that real-life experience to PM as follows: “When you see a construction site of these proportions involving hundreds of people, specialists and companies you quickly understand that all this needs a lot of preparation and professional management tools. Just of the kind we learned in class!”. This entry was posted in BSL Class Experience and tagged BSL learning experience, BSL students, Company visit, practical learning, project management, real learning by bslfaculty. Bookmark the permalink.